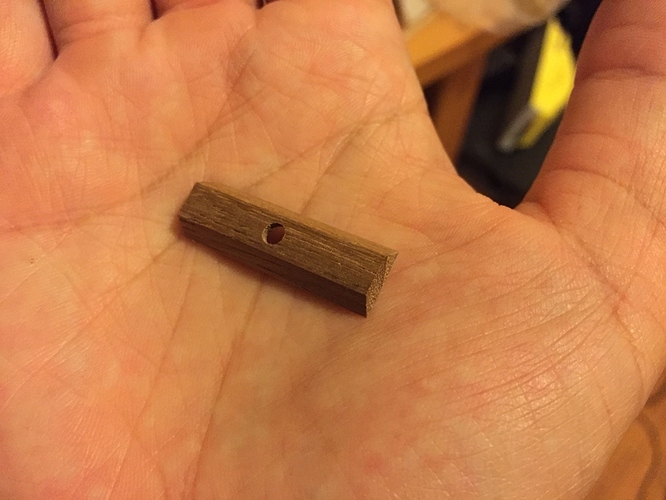 Hey, I’ve got some sort-of intricate/small pieces I’m trying to cut out of wood, and I’m using sticky tape to hold down the stock. The problem is though that I want to avoid placing tape down on the areas that will be cut with the endmill (the tape seems to gum up the endmill), and I want to get the tape fairly close to the cut edges (simply because the pieces are small and I want to get as much holddown as possible). For pieces with lots of 90 degree angles it’s not too bad - just a lot of measuring and drawing lines on the stock and then placing tape. But for other stuff (I want to cut out a 3 inch wide star, but just a 1/4" wide outline of - think something like this, it’s actually kind of sucky to try to place the tape on the stock. I was wondering if anybody had any elegant solutions. Place paper shape on stock and trace it onto the stock. Size image correctly onscreen, hold paper up to screen and trace it onto paper. Any better workflows out there? It might just be easier to tape everything and let the endmill get gummy although I don’t know if, while cutting up the tape, if it is likely to pull up the taped stock nearby (esp if I am cutting very small pieces out - I am also planning on cutting out some .25" x .25" x .5" sticks). For situations like this what I do is flip the stock in MeshCAM and set the depth of cut to .5mm or so, just enough to get the Nomad to trace a shallow outline of the piece. I run that toolpath on the bottom side of the workpiece, and then use the outline to place my tape accurately, then flip it and cut the full job. Works a treat, provided you can register the stock for flipping properly. I came across this tape suggested by Ben on his Applied Science YouTube channel. It is truly awesome, and releases easily with a little soak of isopropal alcohol and comes off clean. He suggests findtape.com but I found mine on Amazon and it is similarly priced. I have not received my Nomad yet, but based on how thin and sticky this tape is, it seems like a really good solution and the clean-up with alcohol is exceptional without residue. As I’m rather certain he’s about to chime in, let me just say I agree with @mbellon that there are many better ways of holding work than tape. That said, sometimes you just gotta use what you have! Oh, also I keep a small bottle of goo-gone near my machine, it works a treat at removing tape residue from cutters. Yes, I’ve publicly stated that I DETEST using double sided tape for fixturing. It gums up my expensive end mills. Cleaning them seems to lead to cuts and blood so I avoid the gummy yuck and potential injury. YMMV. I will do just about anything to avoid using tape but sometimes… one has to go with what works. @MrHume did a pretty good job detailing a good method for dealing with small objects. Leaving an onionskin surrounding each small piece, just enough to hold it to the stock, then flipping, taping and finishing the cut is a great way to do things. If one can do it, put many of these objects in a single piece of stock and do them all at once. Another way do deal with small objects is a compression fixture. No tape. Fix the stock. Press the area to be machines with a compression clamp. Machine around the object using an exclusion region to stay away from the compression clamp. 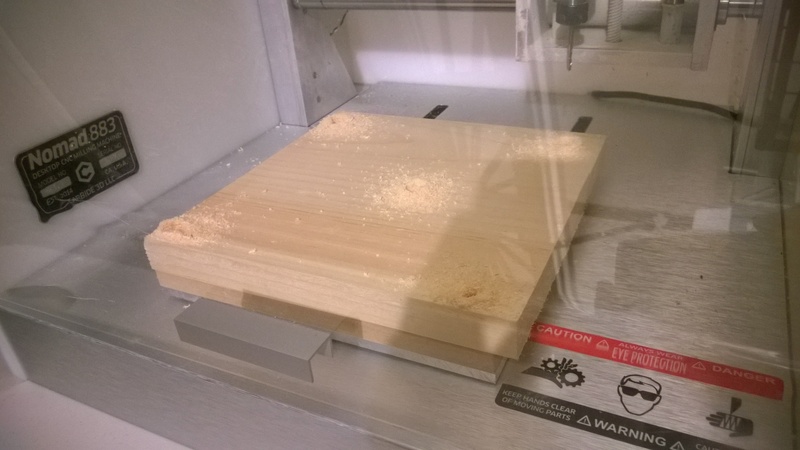 Move the clamp, exclude it in the new position and machine the rest of the object. Release the compression clamp and the object comes free. In a production environment, the compression clamp would be a jig, one that could handle multiple objects at a time. Machine with the jig coming from one direction. Move the jig 180 degrees, machine. Lots of small objects. 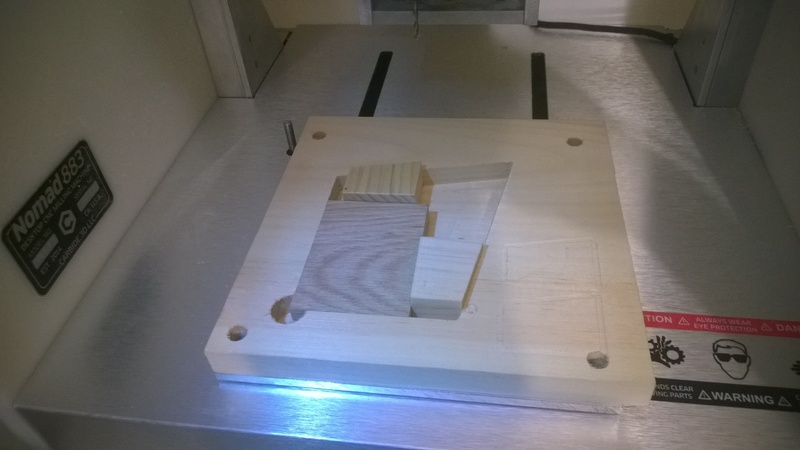 Machining a custom jig isn’t too hard… one has a CNC machine! Sometimes objects have holes in them. They can often/sometimes be used to fixture the objects. Fix the stock. Machine the holes. Put screws/pins in the holes. Machine the objects. Ultimately, there is a whole class of iterative fixturing. Fixture one way to get part of the job done. Rinse, repeat… until it is done. Fixturing twice or three times is not unusual. A sea-of-holes bed makes many approaches fairly easy. Lots of threaded holes for the jig to screw down to. Of course, one can screw into a spoiler board too. This will give one an idea of how objects can be compressed from above. The idea is important, how to implement this is open to many approaches. Yes, I detest the tape, too - even though what I’m making doesn’t have to be accurate to within .001" or whatever, it seems wrong to have a machine so precise and then to squish some stock down with this spongy stretchy tape - it hurts the perfectionist in me. I also have a suspicion that the small pieces I’m cutting move a bit as I get towards the bottom of the cut (just before or as the pieces are cut free of the rest of the stock), as the area of tape is quite small. 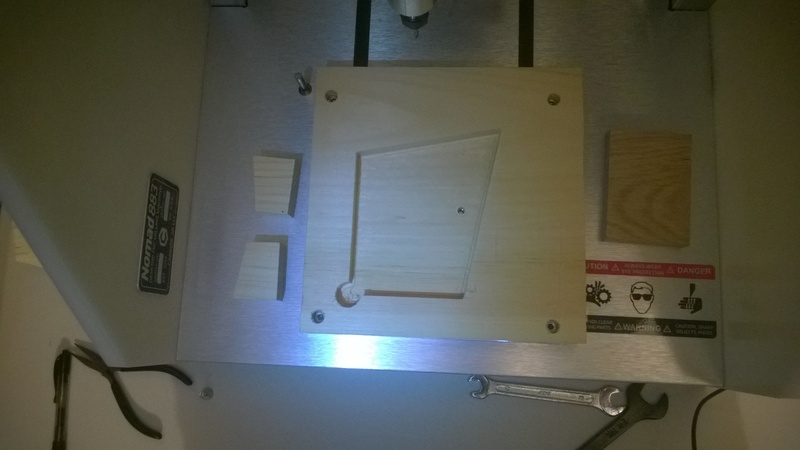 What I was trying to do with some other pieces was using the Nomad to cut out rectangular blocks and then putting those blocks in the vise to finish them. I guess my problem is that the first cut (cutting out a bunch of rectangular blocks) requires the tape, and it requires something like taping around where the endmill tracks will eventually go, or scoring them, both of which entail a lot of measuring and marking. It seems like the only way to make the first cut without using tape would be to use something like what you are talking about - something to clamp from above. So you’re saying I would clamp from above and have the fixturing jig arm come from, say, +Y, and then I’d cut the +/-X walls and the -Y wall, and then move the fixturing jig arm so that it comes from -Y, and then cut the +Y wall? Is there any way you can think of that I could do this with only a horizontal vise (since that is all I have, and I don’t have a sea-of-holes bed, nor all the various screw and clamp systems I’d need?). Also for a non-rectangular object (eventually I want to cut out a star shape. 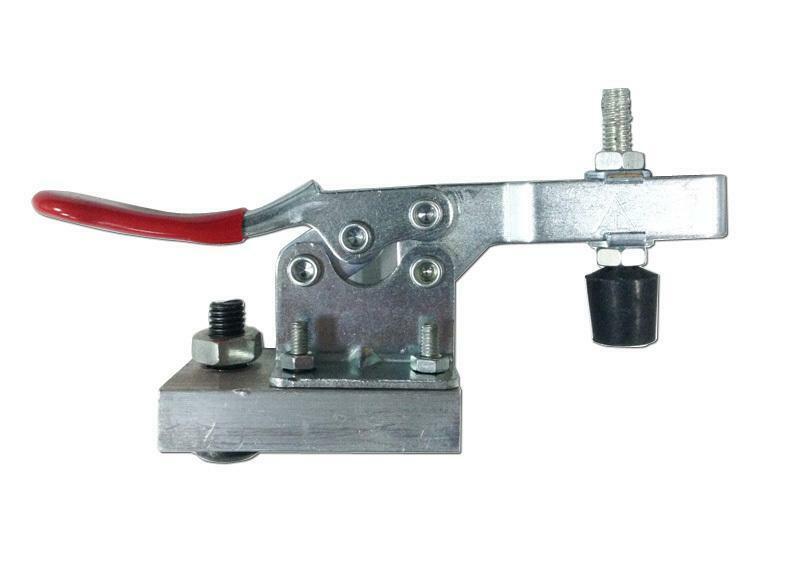 Just so I have some idea… do you have any pictures of what a custom fixturing jig looks like? This is AMAZING fixturing. You jigs are EXCELLENT! So you’re saying I would clamp from above and have the fixturing jig arm come from, say, +Y, and then I’d cut the +/-X walls and the -Y wall, and then move the fixturing jig arm so that it comes from -Y, and then cut the +Y wall? Yes, that’s the essence of what I was relating. Something like the star can be challenging. The prisms, on the other hand, can be done via clamping. Anytime one has to deal with moving a part or a jig, one should be concerned about preserving their X0Y0. Maintaining their Z0 is also a good thing but sometimes one has to zero again. What comes to mind is a simple clamp. One mounted and X0Y0 is found you could crank out pieces one after the other. I’m making this up as I go so please bear with me… the idea will some iteration before it’s ready for prime time. Machine a right angle out of Al (so it lasts). 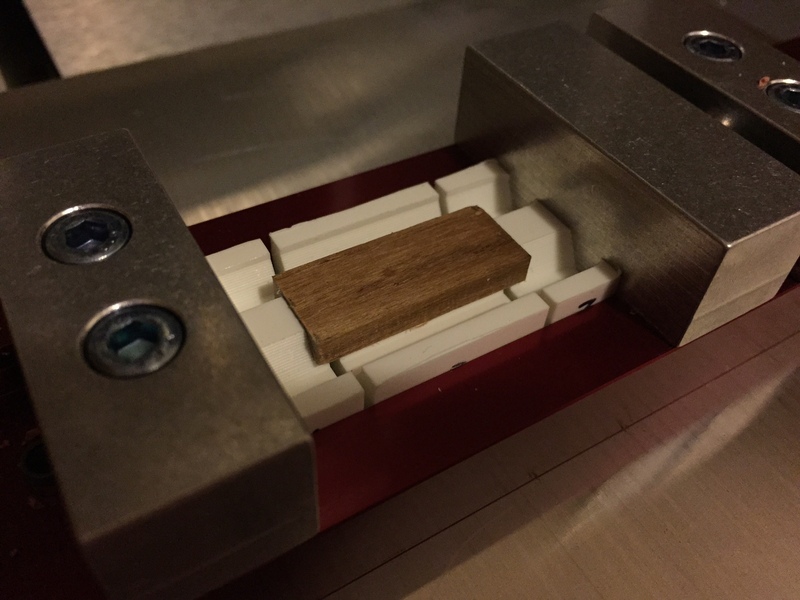 For a prototype, use wood. The corner will need a dog biscuit (or relief) so it is precise. That is as accurate and precise as the Nomad can make. The right angle is made into a plate. The indentation is shallow, less than half of your desired cutting. Put a piece of stock in the right angle, tap it into place with a mallet (gently) and push against it from the side opposite the right angle along the length of the stock. Do the same from the other direction. The stock is not going anywhere. Rough and finish the top. Flip, push in place do the other side. Here is my first Nomad time lapse. I cut another turners cube just to try it out. (Man editing CNC video to get to the 'interesting' stuff takes a while...) Sorry about the shaky bit at the beginning, it only lasts for about 8 seconds or so. and pay attention to the corner, the clamping pieces and how X0Y0 needs to be determined only once. With some thought, custom pieces can be machined - soft/hard jaws - for each piece. A way to use screws to adjust the hold can reduce the mallet work. Yes, I saw those threads by flatballer; I really liked it - very elegant with not a lot of complicated stuff (my first instinct when I think about stuff like this involves, I dunno, dowel pins and screws and vises and lots of steps). Will ponder the star further! (my first instinct when I think about stuff like this involves, I dunno, dowel pins and screws and vises and lots of steps). As I said, I’m thinking off the cuff… but from experience as well. Before we zoom in any approach, let’s study the problem! How many of these prisms are you making? 10? 100? 1000? How often will you repeat the process? Perhaps pose the problem that no tape is used whatsoever? Can you go way outside the box? Lose the vise? Replace the bed? Machine Al for fixtures? The prisms are part of a little art piece that I’m making, and it has 5 prisms. So if I end up wanting to make 10 of them I need to make 50 prisms! Plus more for prototyping (getting the size exactly right so they fit and slide but are snug in the dovetail hole I’ll be cutting in another piece. As long as the stock I start with is at least square, yes, I can do it with no tape, just a vise! I tried the approach I had outlined before (well, without “pressing the rods against each other), and it worked great! And I happened to have a piece of stock that was ~3.5"x3"x.22” square, so I was able to do it completely without tape, which was nice! 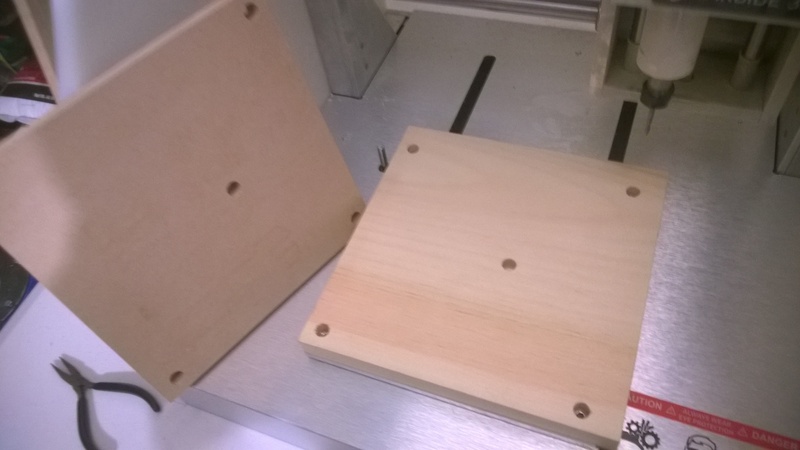 Rotate rod, place back in vise, make more horizontal cuts to cut them into little blocks, now with all +/- X,Y walls square and exactly to the right dimension. Also I faced the top so the top was flat in relation to the side cuts as well. I did, awhile ago, purchase some 8x8x.5 aluminum sheets for making a replacement bed with custom screw holes and stuff (I even got a threadmill and some drill mills so I could cut exactly M4 and M5 screws and holes for dowel pins)! But I think I’m going to hold off on that until I am more experienced with this stuff. I don’t even know what I don’t know yet - I should figure out what I really want to make before I take the time - it seems like making mistakes with aluminum would be super wasteful, both in time and resources. Looks like you’ve come up with an excellent solution! Taking time to think on minimizing or removing difficult or time consuming steps is well worth it - as your exploration shows! Knowing how many is important to the methods to be used. If you have said hundreds, we would want to use a fixture using as much of the bed as possible - potentially 15 or 20 at a time. If producing your prisms in volume is OK at the rate of 4 per “vise load” then you’re all set. If not, we think on using more of the bed and clever fixtures. Soft/machinable jaws are wonderful when working weird shaped pieces and for some fixturing situations (like here). Another success with the “star” shape I wanted to cut out. @mbellon: Back to that whole “jig to make jigs” thing we were talking about - I didn’t want to painstakingly tape, measure, etc. 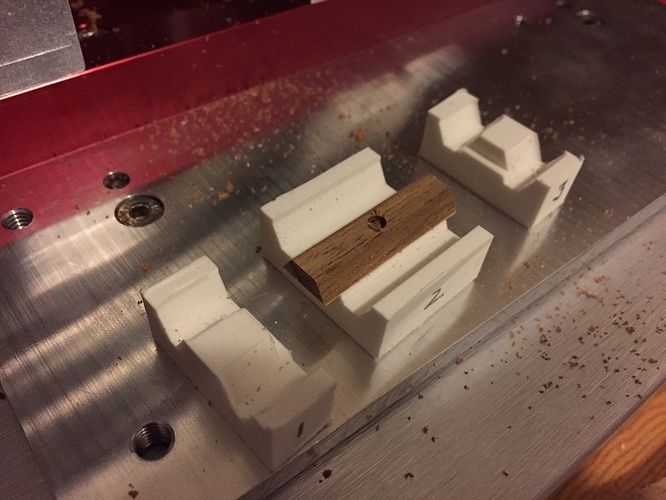 the creation of more softjaws, so I made some softjaws whose only job is to make more softjaws… these are all identical - just a little bar with a raised section in the middle which fits into the slot in the vise so I can locate them along the Y axis. Then a little lip so I can rest my stock on them. Wow! Just amazing work, @kjl. Really great! That line should sand out pretty easily, I think. Start at the lower grits and go up, as with anything. Sand with the grain. You’ve really grabbed onto jigs and gone with it. Nicely done! Some thought… Some jigging… NO DREAD PIRATE DOUBLE STICK TAPE! Yes, CNCed wood sometimes needs a light sanding. I find 180 grit “just right”. YMMV. When possible, machine with the grain, not across it. Also, once the softjaws were machined, I stopped painstakingly zeroing the machine each time - I just wrote down where everything was and made sure all my various fixtures are able to be placed in the same place repeatably. Also, I started zeroing the job to the bottom of the stock instead of the top, so I don’t even have to rezero the height - just change the top height of the job so it starts grinding down from higher or lower as necessary. I feel efficient! I flip the piece over into my negative-space star-shaped softjaws and then cut the star out, and the other pieces either fell away or got dragged a bit into the endmill and then got whacked and flew around a little bit. It was fine, but it seems like there’s the potential for something bad to happen, whether it’s damaging the workpiece or worse, getting jammed in spinning collet nuts or something. … either fell away or got dragged a bit into the endmill and then got whacked and flew around a little bit. It was fine, but it seems like there’s the potential for something bad to happen, whether it’s damaging the workpiece or worse, getting jammed in spinning collet nuts or something. Yes, this is potentially dangerous and should be avoided. In high end machines such a “fly away” can be extremely serious, potentially injuring an operator, damaging the tool, spindle, collet/chuck, or fixtures. On the Nomad damaging a tool is the most likely potential outcome but spindle damage - or damage to the spindle belt - is possible. Undo stress on the collet - which increases run out (a wobbling departure from the true rotation center of the spindle) - is definitely on the menu of potential hazards. In general, when machining, nothing should go flying or be left loose. One can machine everything away but this takes a lot of time and so is wasteful of the machine and increases wear on the spindle and tools. A fixture, or an additional fixture is appropriate. It appears that you’ve got good support from underneath so a fixture that comes from on top and pins the pieces that may fly seems like a good first approach to a solution. 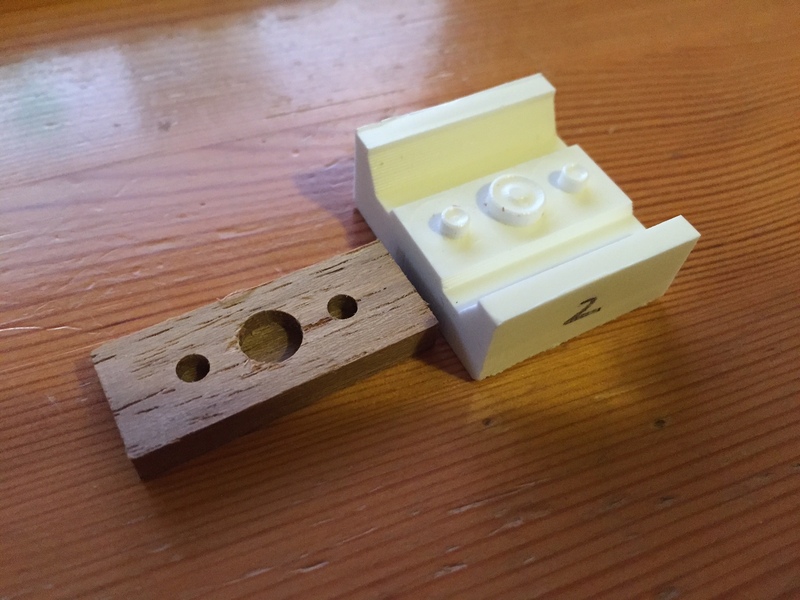 Things may be small enough that the fixture could use WEIGHT to keep things in place. No, I actually don’t have good support on the bottom. I could pin the smallest piece (the tiny triangle on the left) but the 4 largest pieces are essentially hanging in midair. 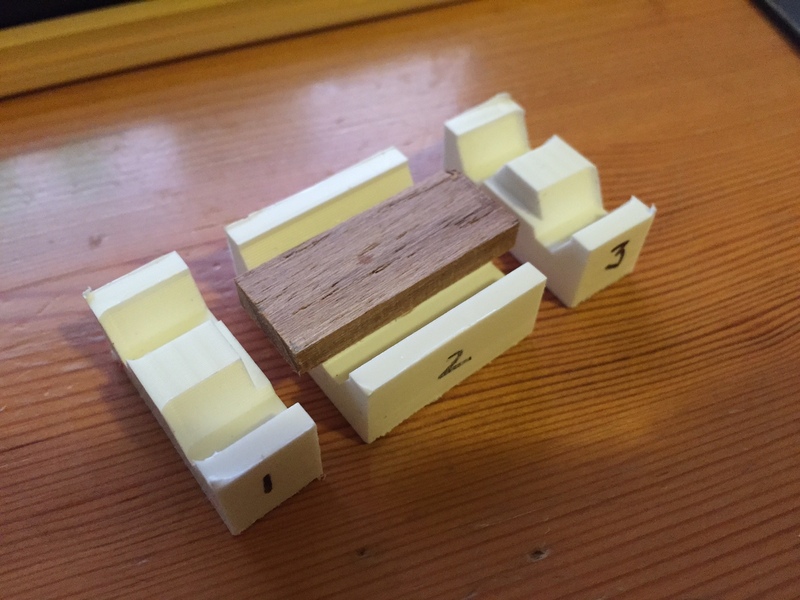 My first thought was to alligator clip and elastic band them to the outside corners of my CNC table so that when they get cut loose the get yanked away from all the action… but then I decided that was probably a terrible idea. No, I actually don’t have good support on the bottom. I couldn’t see clearly but it looked like there was a support underneath. I could pin the smallest piece (the tiny triangle on the left) but the 4 largest pieces are essentially hanging in midair. By pin, that should not mean forced the piece against the end mill. that when they get cut loose the get yanked away from all the action… but then I decided that was probably a terrible idea. I heard of and see videos of industrial fixtures doing things like this. Rather complex. Hmm… definitely warrants further thought. Maybe I’ll leave a little raised ridge on the middle two pieces and pinch them in the gap in between fixutres #1 and #2, and then add a new notch in Fixture #3 and use that to pinch a similar ridge on the rightmost two pieces. I’d get more purchase if I widen all the fixture pieces (along the Y axis). That sounds like a good approach. Just enough of a “lip” going around the outside of the fixture to keep things in place. Fixturing CAN have the elements of beauty associated with them however that is one of the lowest priorities. Focus of effectiveness and easy of creation. Remember that most fixtures are based on prototypes themselves - commercial fixtures have many iterations and much experience behind them. When a totally new situation arises, it often takes a few tries to achieve near perfection (including some beauty).